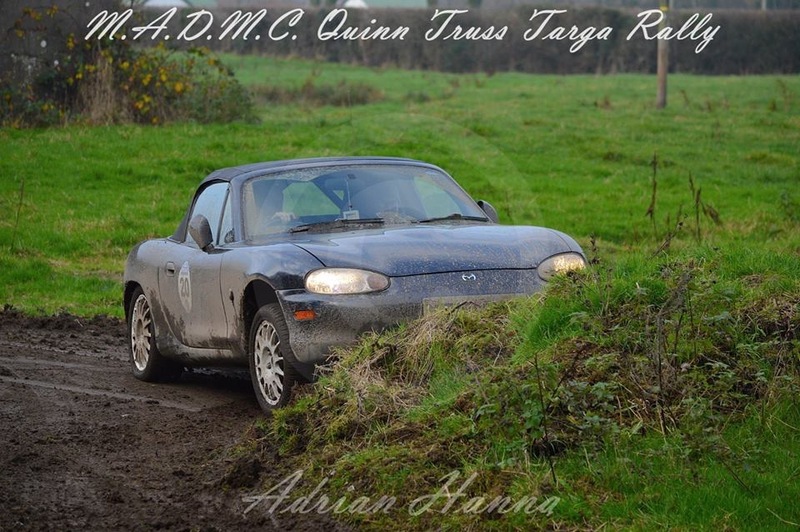 Damien Mooney and Tony Anderson took an almost start to finish victory at MADMC Quinn Truss Targa Rally. 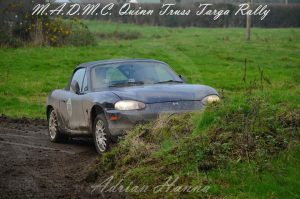 Tyrone crews had a good day out at the Magherafelt and District Motor Club’s, Quinn Truss Targa Rally on 24 November 2018. 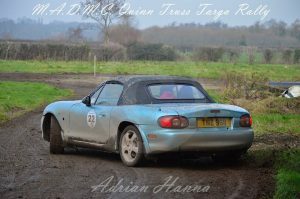 A few of the fancied runners had problems on the day, with Christopher Evans and Kevin Fagan, first into the tests, collecting a Fail on Test 2, and scuppering their chances of their customary top result. 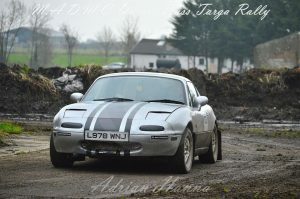 Evans and Fagan were in a Toyota MR2, and not a Lotus Elise as shown on the entry list. 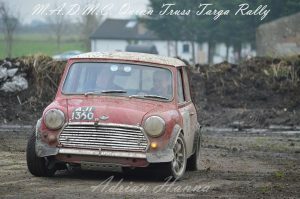 David Burns from Cookstown and regular navigator Tony Anderson were brought to a halt by a failed power steering hose. 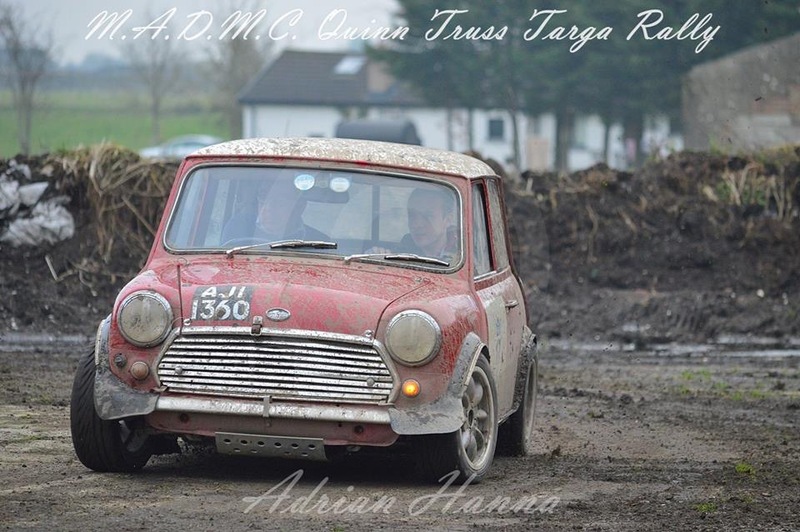 Cookstown’s David Burns and Connor Murphy were running well inside the top 10 until Test 11, when a power steering hose decided it had seen enough pylon work and dumped the fluid out on the road. 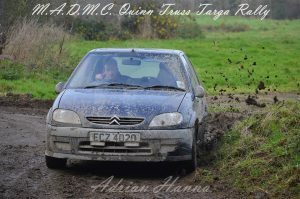 Coagh driver Damien Mooney and navigator Tony Anderson kept cool heads all day in their Citroen Saxo, and after occupying second overall for the first three tests, took the lead on test 4 and stayed there right to the finish. 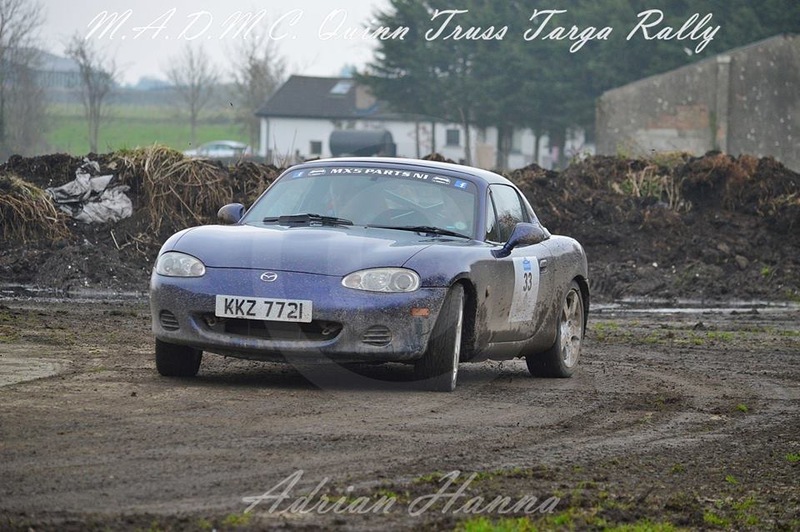 Stewartstown’s Trevor Ferguson, navigated by Nephew Stephen, ran in second place overall for most of the day in his MX5, just slipping to fourth by the finish. Second in Class 2 was still a great result on a very slippy day that probably suited the Front Wheel Drive cars better. 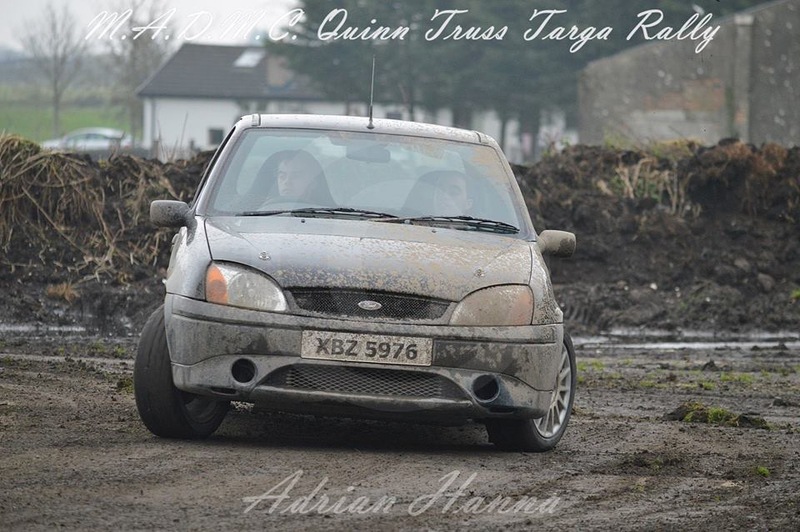 Dungannon’s Darrell and Jordan Burns had a rare mechanical failure when a drive shaft let go on Test 15. The Dungannon Burns Brothers, Darrell and Jordan, were having a good run in Class 3 in their Fiesta, holding a top 20 position until a driveshaft let go as they exited a 360 pylon on Test 15. 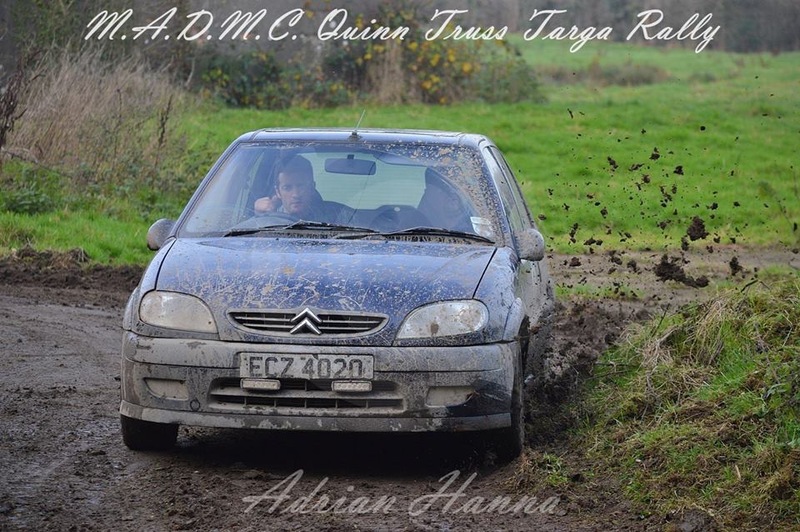 Elsewhere in the classes, Norman Ferguson had young Ciaran McCaughey in the navigator seat and captured 4th place in Class 1 and a top 20 place overall. 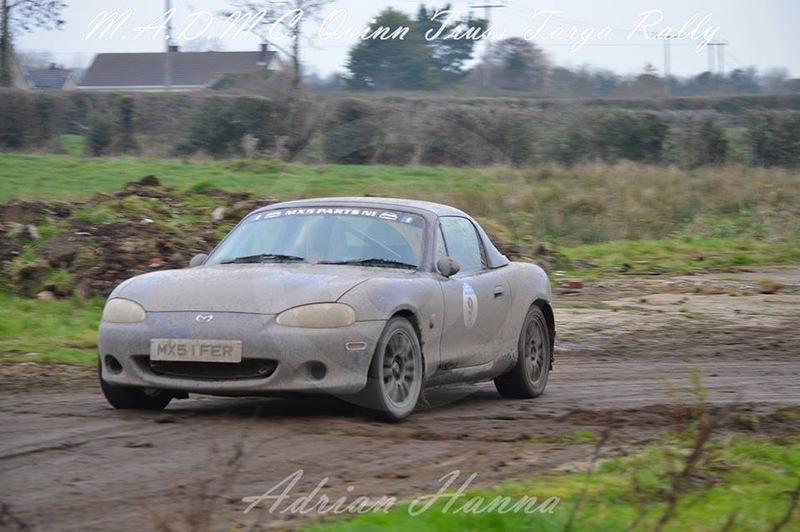 Hayes Robinson and Keith Hall took an excellent win in Class 3 in their Citroen C2 Sebastian Loeb Edition, and Harry Barr chauffeured Malcolm McQueen round to third place in Class 6 in his Mazda MX5. 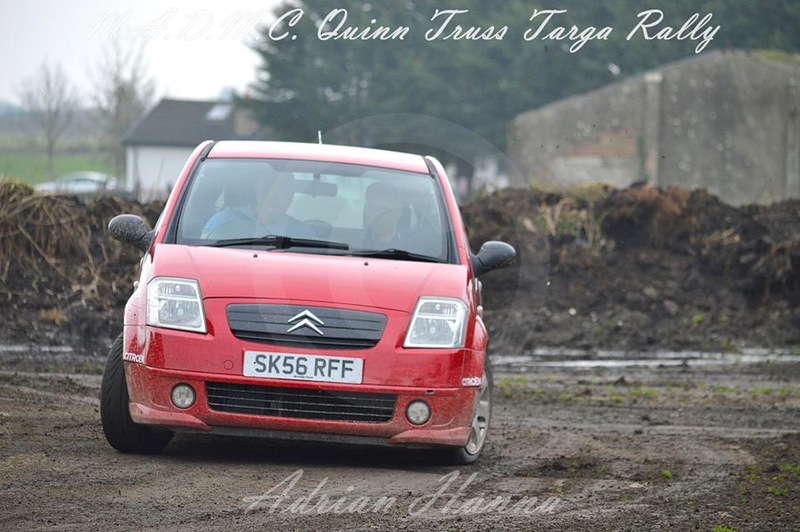 The Class 6 competition was really close with the top three places covered by just 5 second after 20 tests. 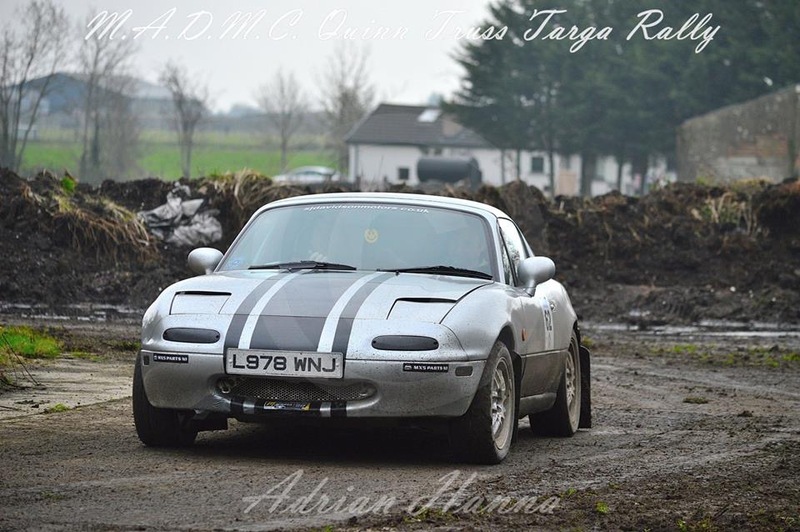 Trevor and Stephen Ferguson ran second overall for most of the day, and took second place in Class 2 at the finish. 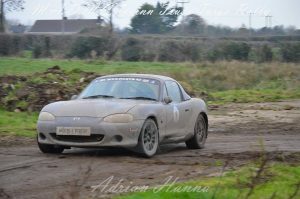 Dungannon’s Chris Nelson and Ian Beavis in their MX5 had a steady day and ended up just outside the top 10 in Class 6 in 11th place. Cookstown’s Harry Barr and DMC Treasurer Malcolm McQueen ran out third in Class 6, just five second off the Class winner. 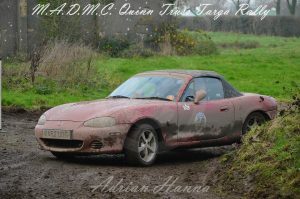 Stewartstown’s Norman Ferguson with Ciaran McCaughey navigating finished 4th in Class 1. Dungannon’s Hayes Robinson and Keith Hall had a smooth run to win Class 3 by 23 seconds. 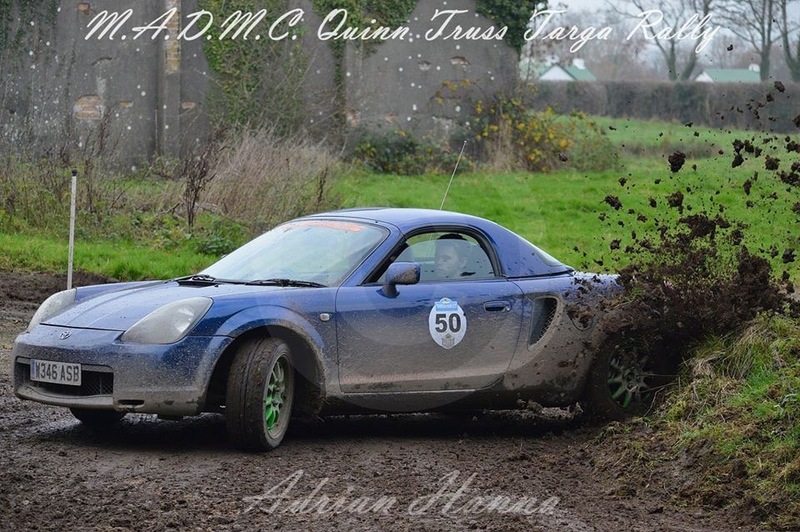 Donaghmore’s Leslie McLean took Stephen McCombe to a steady run and just one pylon penalty during the day. Eric McIvor and John Nicholl had a close battle all day with Leslie McLean, just losing out by 6 seconds. 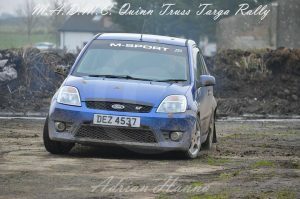 Jason Stirrup kicks up the dirt on a very slippy test. 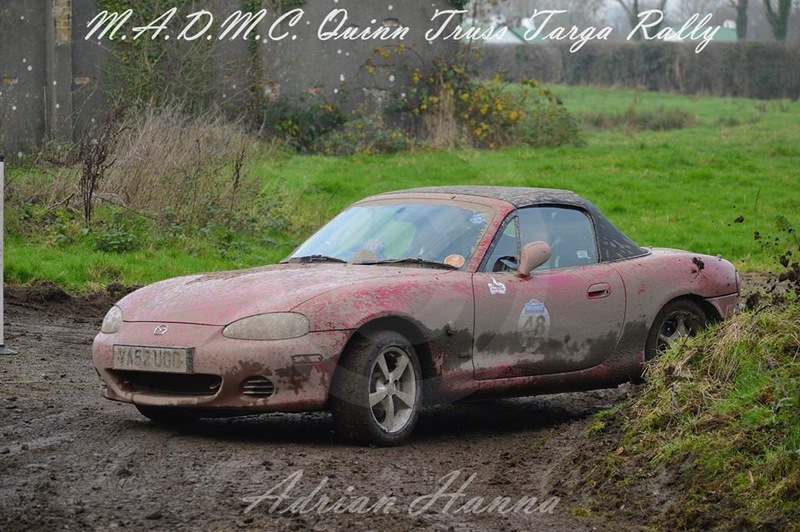 The “drift master” John O’Kane and Sister Grainne take a bite out of the bank on a particularly muddy corner. Coagh driver Damien Mooney with Tony Anderson took great advantage of the slippy conditions and ran out winners overall by 16 seconds.